One of the deadliest scenarios a driver can find themselves in is a collision with a semi-truck. These massive vehicles can cause serious damage to a car and the occupants inside. Many passenger vehicles assume that large trucks can see the road better due to their size and height, but this isn’t always the case. Semi-trucks have serious blind spots that a passenger vehicle can get lost in. If a truck does not see a car in the next lane and decides to make a lane change, it can crush the passenger vehicle. It is important for all drivers to know how to avoid semi-truck blind spots and take necessary precautions while on the road. If you were involved in a truck accident in the San Diego area, don’t hesitate to contact a local truck accident for a free consultation. A good rule of thumb is if a passenger vehicle driver cannot see the truck driver’s reflection in his or her mirror, the truck driver cannot see the passenger vehicle. While driving, it is important for passenger vehicles to stay aware of their proximity to semi-trucks. A truck’s large size can cause significant damage to smaller cars and when a vehicle is in the blind spot, the results can be deadly. Follow these awareness tips to stay safe when driving around semi-trucks and other large vehicles. Keep away from the sides of the truck as much as possible. These can be the most dangerous places to drive. The right side of a truck in particular poses a severe risk to drivers, since truckers have a much larger blind spot on this side. Always make sure that the truck’s side mirrors are visible. Watch closely for signals from the back of the truck. If a passenger vehicle is behind a truck at a safe distance, these signals can help the driver know what is happening up ahead. Keep a close eye on turn signals and brake lights to know where the truck will drive next. Practice patience with slower semi-trucks. Trucks do not have the same maneuvering capabilities as smaller cars and cannot move as quickly. Stay patient and respectful when driving near a truck – any sudden lane changes, aggressive driving, or honking can distract or startle the truck driver, leading to an accident. When driving in front of and behind a truck, make sure to stay in the safe areas. When a passenger vehicle is in front of the truck, the driver should give the truck ample space in case of an emergency stop. Trucks cannot stop quickly like passenger vehicles, so they require ample space in case of an emergency. If the truck’s headlights are in the rearview mirror, the vehicle is too close to the truck. On the other hand, avoid driving too close to the back of the truck. Truck drivers do not have rearview mirrors and cannot see behind them. A passenger vehicle should leave a four-second distance, or about 20 car lengths, between it and the truck. The trucker’s side mirrors should be visible at all times. In addition, make sure to give the truck ample space when it is turning. Passing a truck can be difficult, since a passenger vehicle will need to go through a blind spot. Make sure to signal as early as possible so the trucker has enough time to prepare for the pass. Do not linger in blind spots and complete the pass as quickly as possible. Before merging back into the lane, make sure to be at least two car lengths ahead of the truck. 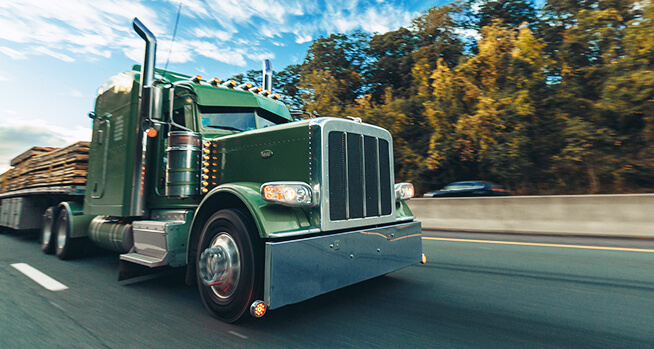 With these tips and careful driving techniques, passenger vehicle drivers can keep themselves and their loved ones safe while near a large truck.